I crouched in the barn, perched atop a trusty orange Home Depot bucket, going through the basics. The 25 or so children sprawled on dirty blankets at my feet helped me suss it all out. Those kids had it down. At its most rudimentary, plants grow from seed, using soil, water and sun to make it all happen. Gathered in the barn before heading out to brave the mud! Kiddos and chaperones watch as I demonstrate pulling a carrot. I wonder if, while our fieldtrippers happily trudged through the mud to pick their own carrots and taste old bolted lettuce (their idea, not mine), it ever occurred to them how close to the plant-growing process they actually were. Sure, they saw bell peppers and cherry tomatoes and they helped wash newly-dug potatoes, but we didn't talk much about one of the fastest-growing plants around. Well, group of plants anyway. Buried in all that galoshes-tromped mud, there were trillions of seeds waiting for their moment. I'd nearly let memories of the Weed Onslaught of Summer fade from my awareness. Don't worry, I have been reminded. After a week of almost 10 inches of rain followed by this week of sunny, sunny days-- well, you know the equation. The thing is, Alex and I had ardently tried to stay on top of our Spring weeding situation. And we'd been fairly successful. We're never going to eradicate weeds. That's not our aim in the slightest. That's what RoundUp is for, and that's just not for us. We're interested in keeping plants we're not intentionally growing from out-competing our intentionals. No strangers to pigweed and carolina geraniums, purslane, ragweed or any number of other common weeds known to the continental U.S, it's the truth that those aren't the weeds that make our fingers ache and our eyes cross. For us, well... we spend most our time pulling grass. McFarmer works on getting the curly kale bed free and clear. This and the pole beans are the last vegetable crops in our Spring field. You can see the remains of Bahia and Johnson grasses tossed from the freshly-weeded eggplants. Some of the most common 'grasses' around our farm are those used for haying, which are even better formulated to grow fast, thick and tall. If the Bermuda, Bahia or Johnson grasses are allowed to swallow up young seedlings—which they will do quickly—they'll choke 'em out. It's headspinning how fast we can transition from farming tomatillos to nutsedges. Perhaps easier, but far less tasty. Nobody really pays for bundles of locally-grown, organic nutsedge. 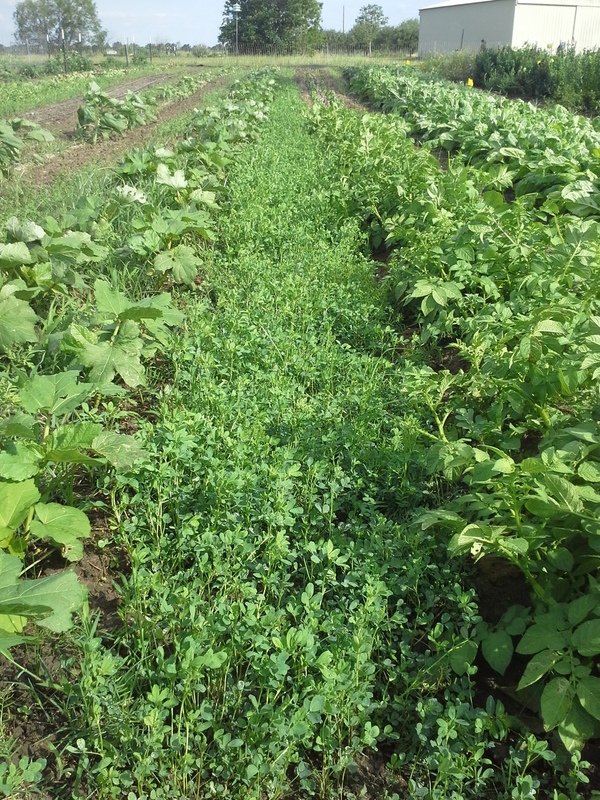 The alfalfa and vetch are going to TOWN in the aisles here between french fingerling potatoes and okra. Hooray! However, we had been feeling quite on top of our weed control balance. Our experiment with planting covercrops in some aisles was progressing well; the vetch and alfalfa were keeping weed growth down while doing good for our soils. But then the rains came. When the field is flooded in several inches of water for days at a stretch with new rain every other day, there's not a lot to be done. Tramping around in it is both highly ineffectual and bad for the soil. So we let the waters recede and the land dry out slowly. We faced the pain of losing lots of crops in low spots where the flooding was just too much. Here's all the color sapped from our dear statice flowers after 4 days of having their feet submerged. Wah. And then we watched the weeds explode. It must be the world once again letting us know we'll never have it all together. You just can't. It was good to have the Spring field ordered and weeded for a time, but now that Summer is here (oh, is it ever) we'll just do our best work weeding with the knowledge that those monocots have got the jump on us. Do our best work, and keep on going. We'll just have to eat cucumbers, okra and homemade salsa to make ourselves feel better. Better to plan what you can and then pull out the nutsedges as they come. And who knows? Maybe customers will buy those bundles if they come with some of that salsa.